So it rained, but people came to help. Then it rained more, and even more people turned up. In fact, it seems that the harder it rained the more people came to help us. Today was a rather simple day, we just needed to check all the boats and kit, drill the lock to make the green end of the Watershed more secure, and fix a couple of open boats. Penny commandeered the main shed for the open boat repairs while the rest of us emptied the boats and kit from the green and blue ends of the Watershed, brushed out the rubbish, checked the boats and kit, re-inflated many, many airbags, replaced some punctured airbags and missing wing nuts, threw away some broken helmets and tightened some loose screws. The rain made us work quickly and we even had time to crowd into the green end of the Watershed for a tea and jaffa cake break out of the rain. Eventually, we had all the boats and kit back in the shed and could go no further until the open canoeists had finished, so we all dispersed to get warm and dry. This was, by far, the fastest Maintenance Day ever, and just goes to show how quick it can be when you have plenty of people (and lots of rain)! A massive thanks to everyone who turned up to help: Simon, Liam, Steve, Hilma, Tanja, Paul R, Bridgo, Lynds, Rach, Adam, Alice, Niamh, Bradley (and Eliot) Glynn, Helen C, Penny, Philip, Mark, Paul Rodgers, Lew and Val. 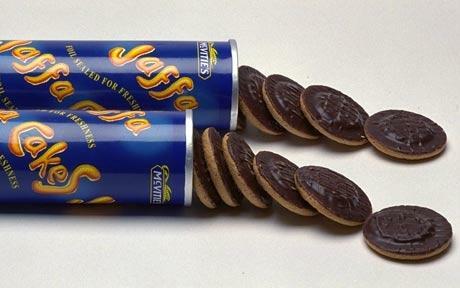 No photos sadly, it was too wet, but here is a picture of a jaffa cake because we ate about a metre of them.